One of the fascinating aspects of travel photography is photographing people watching action. It's a good idea to keep looking at the crowd and see how you can work spectators into your action shots. Paragliding is not the easiest sports to combine the action and spectators, but it can be done with an appropriate selection of lens and vantage point. 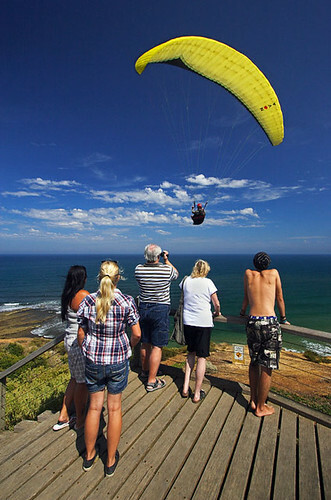 Near Bells Beach in Victoria, there is an excellent lookout for spectators to view paragliding. It's a brilliant spectacle to see the paragliders flying over the heads of onlookers on a sunny day, and the use of a wide-angle lens provides the photographer the chance to get up close to the spectators and photograph them and a paraglider. Travel Photography Tip: Put a wide-angle lens on your camera, get in close to the spectators, and capture them watching the action. It makes for interesting people shots. Gloomy weather provides landscape photographers the opportunity to get creative. With a wide-angle lens, you can create drama in your landscape scenes by including plenty of foreground interest and a threatening sky. 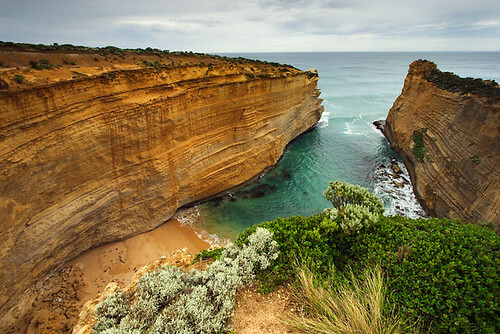 This image taken in the Port Campbell National Park in Victoria was made using those exact principles. Travel Photography Tip: Shoot wide when it's gloomy. Use a wide-angle lens. Artists will shine during the June long weekend in Grenfell, New South Wales. Painters, poets, photographers and writers will be celebrated as they are awarded the highly sought-after bronze statuettes in their respective categories. Some artists will travel vast distances from around Australia to catch-up with old friends and enjoy a bit of a yarn. 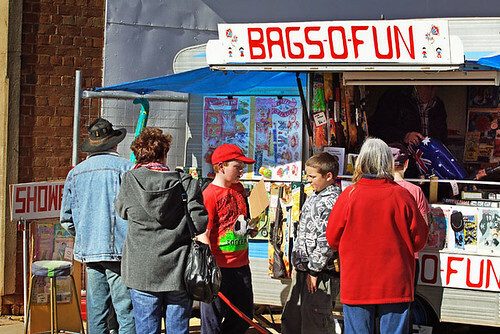 The Grenfell Henry Lawson Festival of Arts provides a unique and valuable opportunity to mix with fellow artists. As a photographer, learning about what other artists do and their motivation for doing it, does inspire me greatly. I've made good friends in Grenfell and sat with some around the crackling camp fire while sipping tea and eating damper while listening to the poets at the Henry Lawson obelisk. Grenfell's 55th Henry Lawson Festival of Arts is certain to produce a great vibe. 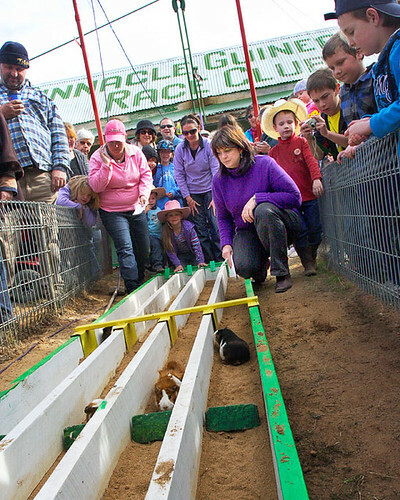 You might like to come along and see the guinea pigs fly, watch the singlet-wearing blokes at the woodchop, eat a sausage in bread while listening to buskers, enjoy a dramatic play, recite a poem or two, or participate in a travel photography workshop. The woodchop competition sure draws a crowd, and with the chips flying outside the Railway Hotel, onlookers will be cheering loudly. 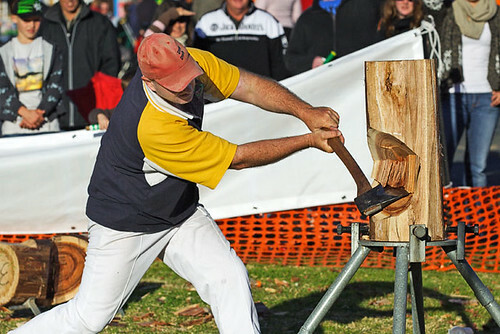 It's one of the most popular attractions during the festival, and I've seen some of the crafty old blokes beat the young axemen in the various events. 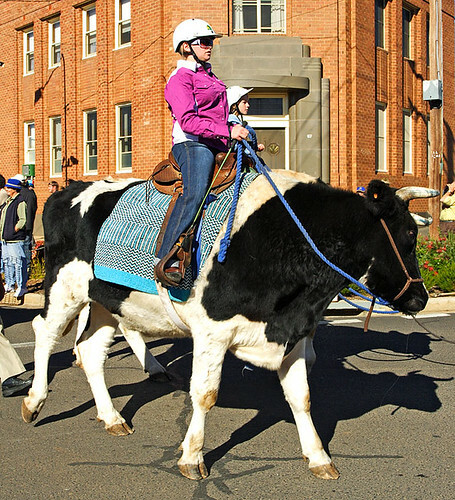 I vividly remember the street parade in 2008 where I saw a young girl riding a bull. Being a city slicker from Melbourne, that's not something I see every day of the week. The parade is always a great spectacle and a perfect opportunity to get involved and take photographs. Community groups, school children, Cobb & Co, vintage car clubs, the Grenfell Town Band, dance groups, and various other floats add colour and noise to the festival's most popular event. For a small town, Grenfell puts on a big show, and they do it with gusto. You can browse through the art exhibition and snap up a bargain or two. The photography exhibitions display award-winning photographs that would look great hanging on a wall. A wide variety of street stalls cater to those with a sweet tooth and those who need clobber. This year's festival theme is "The life and times of Henry Lawson 1867-1922." Henry was a bit of a character, and a great writer who is part of Australian folklore. 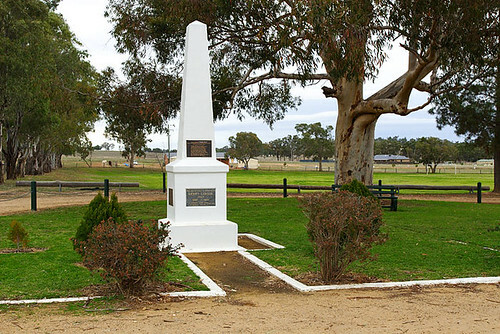 He was born on the Grenfell goldfields and an obelisk is located on the spot where he was born. Whenever I visit Henry's obelisk, I feel like I'm in a sacred place. The Festival Queen is back on this year's program and it's sure to attract local beauties. The ladies will be doing their best to raise monies for local charities, and the winner will go on to represent the festival for the following 12 months. I'm certain the Grenfell people would roll out the red carpet if they had some, but a handshake or a kiss on the cheek is a given. Come along, have fun, and enjoy a great celebration of the arts. 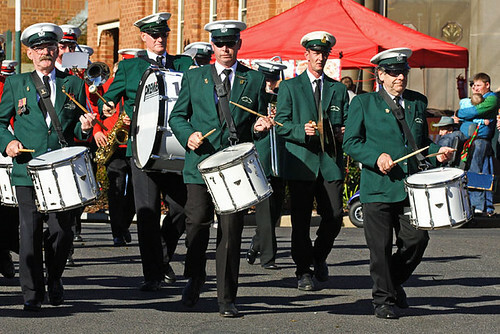 The 55th Grenfell Henry Lawson Festival of Arts will be held on 8-11 June, 2012. Are you a photographer who wants to learn new skills? With a little research and planning, and new knowledge and skills, you can produce better travel photographs. Photography is a healthy activity and it provides the opportunity to discover new places. A travel photography workshop in a friendly environment with like-minded people inspires creativity and the sharing of ideas. 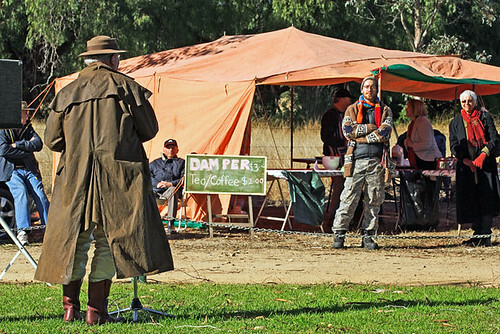 The 2012 Grenfell Festival Travel Photography Workshop will be held on Saturday June 9, 2012 at 8.30-11.30am. I am hosting the workshop, which will be a 3-hour guided walking tour workshop of historic Grenfell in New South Wales during the 55th Henry Lawson Festival of Arts. Each participant will receive an information pack containing gifts, travel photography advice articles and tips, and photographer's guide. Check the 'Workshops' page where you can download the Information Sheet and Booking Form, and a workshop flier, which you can print and distribute. For many photographers, the lure of travelling to towns in rural Australia is undeniable. 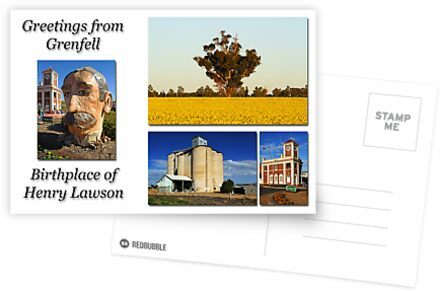 Grenfell in the central-west of New South Wales is steeped in history and the sense of community is strong. With friendly locals mindful of promoting their town, they display pride in organising their major tourism event for the year. Volunteers provide countless hours to organising the Henry Lawson Festival, which is held on the June Long Weekend each year. The result of their efforts is that locals and visitors from around Australia get to experience a great celebration of the arts. In seeking to inspire people to visit Grenfell during the festival to participate in photography, I am conducting the 2012 Grenfell Festival Travel Photography Workshop. The 3-hour guided photography walk around historic Grenfell, which has been endorsed by the festival committee, will provide workshop participants the opportunity to gain a better understanding of travel photography subjects, technique, composition, and lighting. This understanding is designed to assist participants to acquire a heightened level of confidence, and to approach image making with a reasonable expectation of creating better travel photographs. Workshop participants will receive an information pack that contains specialised advice and tips on how to improve your travel photography skills and knowledge. The pack will contain gifts, and travel, tourism and photography information about Grenfell and the surrounding region. 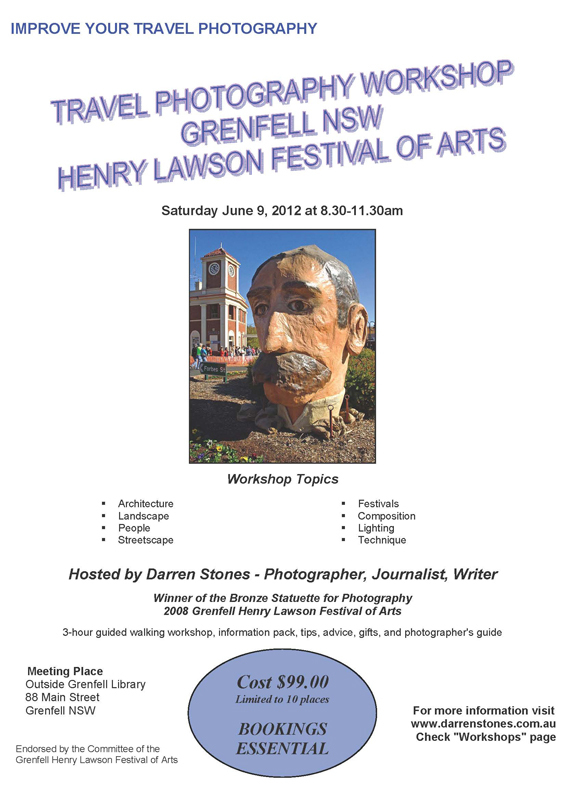 Places for the 2012 Grenfell Festival Travel Photography Workshop are limited to 10. It is highly advised to book early. For further information about the workshop, check the Workshops page on this site. Photographers are provided a unique opportunity to enter their photographs in the photography competition and have those works displayed in the exhibition for the duration of the four-day festival. Visitors to the exhibition are usually impressed with the high quality of imagery displayed, and in subsequent years many have become inspired to enter their own photographs. I highly encourage photographers to enter the festival's photography competition as it will make for a fulfilling weekend for those photographers who participate in the workshop and see their photography hanging at the exhibition.